On the sales manager’s list of tasks, recruitment ranks low among priorities. When there is a need for one or more salespeople, managers dive into recruitment and put all their forces into battle. Often, just to hire the “least worst” candidates at the end of the recruitment process. 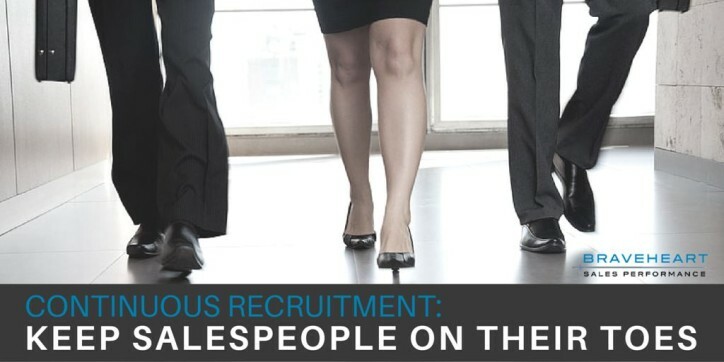 Continuous recruitment acts as an anti-complacency mechanism within sales organizations. Complacency insidiously, but surely, presents itself as soon as a manager lifts their foot off the accelerator. When this happens, almost immediately the sales team stops doing certain activities that produce results─ and performance suffers. Some business leaders are adopting a continuous recruitment process to support their anti-complacency mechanism: firing the least efficient 10% of salespeople each year. When salespeople work in a company with such a mechanism in place, there is naturally a ripple effect that occurs and the overall performance increases. For some business leaders, this is an essential element of the growth strategy on par with the acquisition of new market shares. Top-level sports also provide examples of this strategy; on any professional or Olympic sports team you will find constant competition, a constant influx of “new blood” and a constant raising of the bar. The classic view on the usefulness of recruiting salespeople is simply that it serves to expand the team or to replace a salesperson. However, the primary role of recruitment must be the improvement of the overall level of the sales force, i.e. to raise the bar. Every sales manager must make it their ongoing goal to hire a salesperson with the potential to be better than their best seller. Major sporting teams have to identify such candidates; they seek, test, recruit, train and develop their potential talent. The same must happen in sales organizations. These talents are visible in the eyes of those who seek them. LinkedIn has estimated that only 20% of workers are actively searching for a job. It is among these 20% of available candidates that companies typically have to find their new salespeople ─ unless they are continually recruiting. A continuous recruitment process is designed to provide access to the 80% of passive candidates who are waiting for opportunities. The skills needed to recruit good salespeople should not be solely in the hands of headhunters and employment agencies. Business leaders and sales managers can acquire these skills. By learning the basics of recruitment for sales, and with the right tools, businesses can become independent in the art of sales talent recruitment. This strategy also allows you to tune in to the most predictable criteria for success in sales within the organization. Recruitment must not be seen as a tactical aspect in sales organizations, but rather as an element of growth strategy. With a pool of pre-selected candidates, you have the ability to make business decisions that would otherwise be delayed, avoided or circumvented out of concern for their impact on the sales organization. 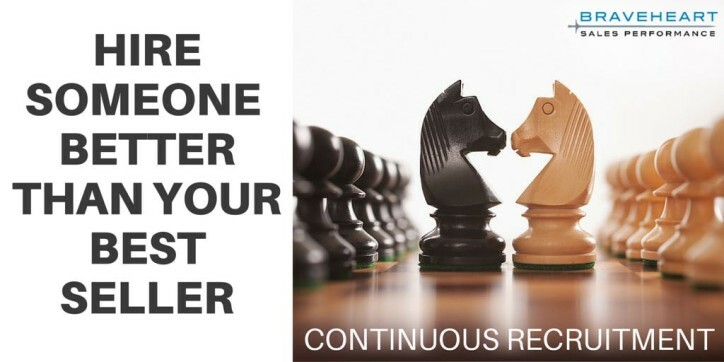 Do you have an opinion about continuous recruitment? Let us know in the comments. Image credit: © Can Stock Photo/Leaf; © Can Stock Photo/18percentgrey; both modified by resizing and text overlay.